I’m somewhat embarrassed to admit that I’ve never visited this area during the summer. I used to come here frequently to ski since it is the nearest major ski area to Southern California, about a 5 hour drive. 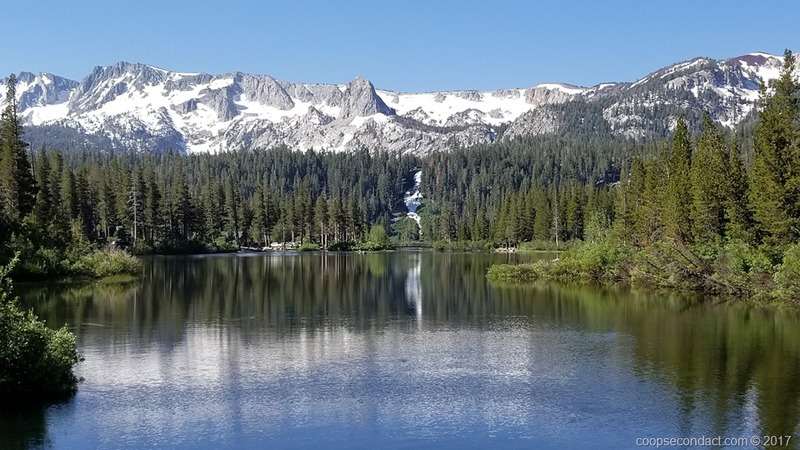 So this portion of our summer itinerary was built around a stop in Mammoth Lakes. We parked at the Mammoth Mountain RV Park. Sadly, one of the major areas I wanted to visit here, Devil’s Postpile National Monument was closed to allow for repairs to the road that leads to it necessitated by winter storms. But there’s still plenty to see and do here. It’s not named Mammoth Lakes for nothing. There are many, many lakes to explore in the area they call the Lakes Basin. There’s Twin Lakes along with Twin Lake Falls, Lake Mary, Horseshoe Lake, Lake George, Emerald Lake, Crystal Lake and many others. These are all beautiful mountain lakes surrounded by soaring snow dappled peaks. This past winter left lots of snow which is still melting and roaring down mountain creeks into these lakes. We enjoyed lots of hiking among the lakes. We also went out to see the Inyo Craters. These two large and deep craters were created only about 600 years ago when magma rose up near enough to the surface to come into contact with the underground water table. This resulted in a massive explosion that created these craters as well as a large fissure located a few miles away. We also timed out stop here to coincide with the annual Mammoth Food and Wine Experience. This is an annual event that benefits the Mammoth Lakes Foundation. Quite a nice evening with terrific freshly prepared food and lots of wine and beer to try. 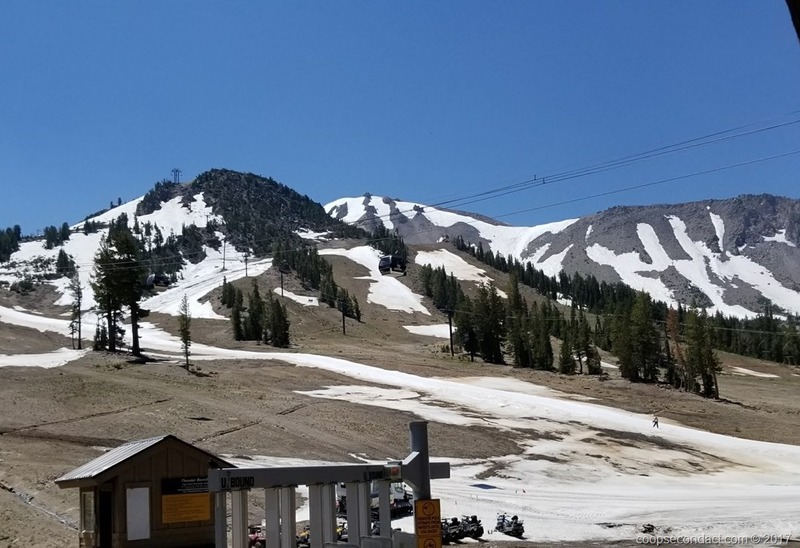 As I mentioned, the recent winter dropped massive amounts of snow in the Sierra Mountains (600 inches around Mammoth) and as a result, there is still (limited) skiing available on Mammoth Mountain. We went out to the main lodge to witness it firsthand. Not my idea of a good time but there seemed to be plenty of people willing to give it a go. I’m thinking mostly for the novelty of skiing in mid-July. The website says they expect to be open into August. If you want to do it all in one day, you can ski, ride your bike through the downhill bike park and play 9 holes of golf for $99. What a beautiful lake view with amazing reflection of gorgeous mountains! It’s true. We were there and when I look at the photos I’m wowed.